The CMP range at Talledega ran a shakedown 2700 on 27 Feb on electronic targets... The guys I've heard from had lots of positive things to say.. Were (are) the e targets usage going to have a disqualification if you have two frame hits. Is that written somewhere. Or is it speculation? The above quote indicates some sort of qualification. That's one of the problems with the electronic target implementation. They aren't addressed in the NRA rules at all, and the CMP rules are....less than fully workable. 4. Concern over training on lights or turns. BS, adapt. Adapt is one thing....we still don't have rules to know what e-target shooters are adapting to. Also, are there going to be a whole different set of national records for e-targets? I say yes. That needs to be addressed BEFORE we start shooting matches on them. What's the latest on drainage at Perry? Do I need to bring my mud boots? Rob Kovach wrote: Also, are there going to be a whole different set of national records for e-targets? I say yes. That needs to be addressed BEFORE we start shooting matches on them. They didn't reset the records when we went to optics, which I believe is/was a bigger deal than eTargets. When you look at the records many from the '70's still stand. AllAces wrote: What's the latest on drainage at Perry? Do I need to bring my mud boots? I haven't removed the Perry mud from my boots from years past as it's considered lucky mud and improves your score. In a matter of months, highpower rifle and pistol competitors around the country will be able to enjoy the same state-of-the-art electronic Kongsberg Target Systems (KTS) targets used at the Civilian Marksmanship Program’s (CMP) Talladega Marksmanship Park, without having to make the haul all the way to Alabama. 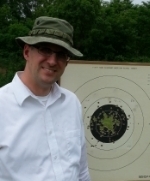 On the Camp Perry Petrarca Range in Ohio, KTS targets for rifle, pistol and smallbore are currently being installed. The project is going according to plan and is within budget – with completion expected by the end of June for CMP use and those attending the National Matches. Electronic targets to shoot at at Perry?? Sign me up! I want to see how many times I can hit the frames! If they ask what I was doing I'll reply I was shooting Action pistol for a while.